After the rain subsided I was walking across the parking lot and I noticed the ground was just littered with these beautiful colorful circles. 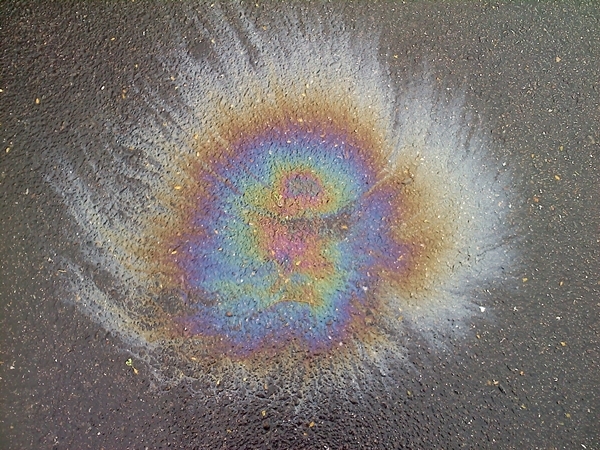 I am not sure what caused it but I am guessing it is oil and stuff that has leaked from cars as they drove by. There were about 7 of these and they disappeared pretty quickly right after I took photos of them. To me, they were aboslutely magical and gorgeous. They were scattered all over around me and I tell you what, I just thanked the Universe for sending me such beauty. You just never know when or where true magic and beuty will show up for you. This day, was one of those moments for me. I am truly blessed.